From a distance it was not possible to see the deterioration of the timbers in this gable end of this c1620 2 bay cottage with later cross wing, However, due to concerns raised by the owner, we then carried out a condition survey which, on close inspection and with the aid of a metal probe we were able to determine that many of the timbers were very seriously decayed. Following our conservation principles we removed the minimum of historic timber and spliced in new timber to reinstate the gables structural integrity and aesthetic appearence on this early c17 cottage. to prevent further decay we dug a french drain all the way along the front of the cottage. After completion we produced a 'Post remedial report' for the owners so that they could provide information to the local authorty and future owners. The main structural timbers of the Jetty on this mid 15c service cross wing end of a much larger house, were seriously decayed, making the jetty unsafe. We removed all the visible decayed timber and replaced with new dry oak, faithfully reproducing the size and shape of the timbers. Then grouted the margins of the panel infill with non hydraulic lime mortar. This tiled floor in the original open hall was found to be in a very poor state. Most of the 'Pamments' were spalled and the floor was very damp, in some areas actually wet. We recorded each pamment then lifted them for cleaning. Any tiles we were unable to salvedge, were replaced with reclaimed ones that were carefully sourced to match the originals for size and colour. After removing sufficient soil to work we laid a layer of expanded glass foam which has high thermal resistance and forms a breathable barrier, this is an eco friendly and appropriate method of insulation for historic buildings that also makes a good surface on which to relay the floor. The pamments were laid on a non hydraulic lime mortar and grouted with a dry mix of hydraulic lime. The floor was hand worked with a brick rubber to remove any high spots before two coats of linseed oil were applied and a the floor was given a final shine up with beeswax. During the work we removed approximately four inches of soil and heavy clay and were careful to record any artifacts and evidence of historical development, finds included many animal bones, large quantities of glass from many periods and pottery including a piece of early green glazed pottery, possibly from the Farnham pottery which is not far away. Some cream and red ware sherds. 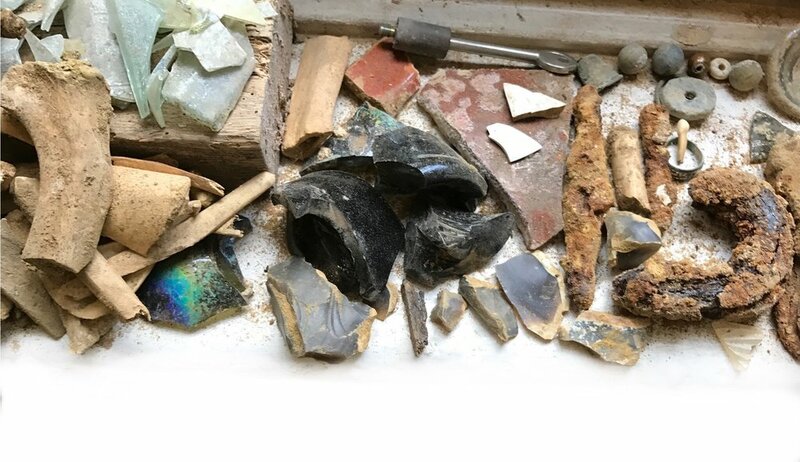 There was a variety of everyday objects as well, such as a thimble, a weight from a spinning wheel, several stone musket balls and some glass beads. This chimney in Chichester had suffered from erosion due to time and weather. Later interventions includes the introduction of cementitious mortar and the replacement of the chimney pots with flue liners. We raked out the loose and badly eroded old lime and cementitious mortar, re-placed broken and spalled bricks with matched reclaimed bricks, matched new non-hydraulic lime mortar and re-pointed using the original "penny struck" form. We removed the chimney liner from the top of the chimney and commissioned three new chimney pots to be made, which we fitted and flaunched around to weather in and secure. The work we carried out here will preserve the chimney for many years and will have restored the former skyline. Due to concerns expressed by the owner, we carried out a condition survey on this early 17c cottage in Alton. We found that it required extensive work to both the structural timbers and the brick panel infill. Many of the timbers were severely decayed due to water ingress and impermeable coatings applied to them, trapping the moisture. We removed most of the timbers and repaired where it was possible. we carefully removed the brick panel infill and put it back replacing where necessary. All mortar was non-hydraulic lime matched to the original. Here in Broadbridge Heath an historic ceiling had been replaced with a plasterboard ceiling. The owner asked us to re-place this ceiling of inappropriate materials with a replacement ceiling of laths and lime.